..... well I was wrong! This is made from leftover aqua fleece (lining) and fluro red ripstop (only 6 metres left). I adapted a costume pattern and I'd say I'm about 95% right. I measured the dog and he did a fitting (I can't believe I said that) and I just needed to put the velcro on. So in the last two weeks either the coat shrunk (no) or the dog has put on weight. In all fairness, the dog had his food changed a couple of weeks ago and has suffered ever since. He's been having epileptic fits and my Mum and sister (who's dog it is) have been very distressed about it. They changed the food back after a bit of Google veterinarian advice (and the real vet at a cost of nearly $500) and he's doing well now. Forecast is heavy rain on Thursday and Friday so I thought I'd better get it finished. I have to put an extension on the front strap to fit around his belly and then he'll be all ready. Overall, I'm pretty happy with it. Endless summer....stash busting with Burda 7231. It was last day of school holidays today and my son and I went to see Shaun the Sheep, have some sushi and gelato down our suburb (we live 10 minutes walk in opposite directions to two independent cinemas so it's cheap and close!). I wore my new dress ... I've been struggling to feel it is finished so I hadn't worn it till today. I made Burda 7231 about 4 weeks ago for our seemingly endless summer. Looks perfect for a long hot summer but it is deceiving. Maybe I should have taken more notice of "young" on the envelope. I made it from some rayon I bought late last year at East Coast Fabrics. I really love the purple/grey with the flowers... one of my 4 sisters (or was it my niece?) said it looked like curtains! Hmph! No hand made things for them. I've just come across a fabric sale that is in Melbourne on Saturday 18 April. Below are the details from designerstitch.com.au where they have a list of fabric shops in Brisbane and surrounds and also through the rest of Queensland and the other states. I'm sure if you live in Melbourne you are aware of Designer Stitch School of Fashion and Design, but I'd never heard of them before. 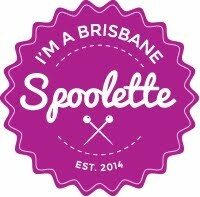 The list of fabric shops in and around Brisbane is very comprehensive and there are some I have not heard of before. Massive Italian Fabric Warehouse Sale April 18th – Open Direct to the Public One Day Only – Saturday 18th April from 9.30 am until 3.30pm. 5 Marriott Street, Oakleigh. (off Dandenong Road ) ( the building does not have an obvious sign – with only a small sign in window that reads “ Christopher George”) Fabrics at wholesale prices – ALL imported direct from ITALY….